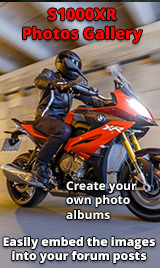 If u hadn't bought the S1000XR what would you be riding? Just wondered what other bikes we all considered before pulling the trigger on the best all rounder on the road today??! I was originally going for a 2016 R1200 GS Adventure , after test riding a Ducati Multistrada DVT and enjoying the ride, but having a few reservations about the seat and the dealer back up. Re: If u hadn't bought the S1000XR what would you be riding? I considered a Multistrada DVT, but after hearing about ongoing issues with them, even the new model, coupled with dreadful residuals, went for the XR. If I ever win the lottery, and can treat one as a disposable item, I'll buy one! Probably another Triumph Speed Triple, bags of character and a cracking engine, the wife encouraged me to keep the old one Triple when buying the XR but the wallet said otherwise. Not one regret to date although the S3 was brilliant also. I had the MS 1200s DVT for 11 months. It had some minor quality issues but was really nice. XR is nicer though. Better quality, easier to ride fast, a tad faster, has a QS and cost very little with the trade. The only thing I ll miss is the v2 soundtrack. Triumph Tiger 800XC, cracking bike. In fact it's for sale if anyone is interested.